Description This Divya Desam is located in the heart of Madurai. Madurai is known primarily for its grand temple dedicated to Meenakshi and Sundareswarar, which overshadows the Tevarastalam Tiru Aappanoor and the Divya Desam Tirukkoodal. 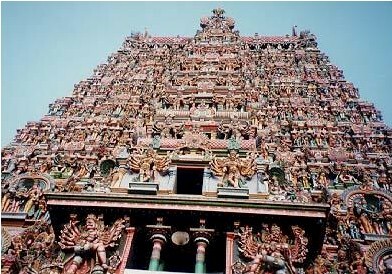 Pictured above, is one of the gopurams of the Meenakshi Sundareswarar Temple (Tirukkoodalaalavaai). Tirumangaialwar mentions Kozhi (Uraiyur) and Koodal in a verse while Tirumazhisai Alwar mentions Koodal along with Tiruvenkatam in a verse. Perialwar is said to have sung Pallandu at Koodal. Kallazhagar is enshrined at Azhagar Koyil, and Srivilliputtur enshrines Kattazhagar, while Madurai enshrines Koodalazhagar. Deities: The Moolavar here is Koodalazhagar in a seated posture facing east, while Taayaar is Madhuravalli in a separate sanctum. The name Koodal stems from the legend that at the behest of Vishnu, four clouds gathered at Madurai in the form of tall buildings, and prevented a deluge from overpowering the city. The temple: This temple covers an area of about 2.5 acres. This is a beautiful temple, with interesting stone grills and sculptures, two prakarams and a five tiered rajagopuram. One can climb up and take a closer look at the Ashtanga Vimanam which enshrines Pallikonda Perumal in one of its levels, and Surya Narayanan in a standing posture in the other. This aspect of a vimanam enshrining three different postures of Vishnu is similar to that at the Vaikuntha Perumaal temple at Kanchipuram. This vimanam which dwarfs the rajagopuram (as in Tirukkoshtiyur) is of great beauty; stucco images depicting scenes from the epics are noteworthy. Imposing stone walls surround the temple. There are also shrines to Lakshminarasimhar, Ramar, Krishnar, Andal. The Navagrahams are enshrined here, a feature not seen in Vaishnavite temples. There are shrines to Lakshmi Narasimhar, Aandaal, Krishna, Rama and the Acharyas. Festivals: Six worship services are offered each day. The annual festival is celebrated in the month of Vaikasi, during which Dasavataram is enacted. Also celebrated are the Maasi Teppa Utsavam, Aadi Pooram, Krishna Jayanti, Purattasi Garuda Sevai, Navaratri, Kartikai and Vaikuntha Ekadasi.